ot sure when the last time was that i did this. and not sure why i decided to give it a shot today. oh, yeah, it was because someone told me she had gone to the ‘skinny stems’ post and that there was a kind of weird comment. i just checked – nothing that i can see. have no idea what she saw. hmm, perhaps i need to use the link from the webpage and see if i get to the same place she did?? ok, so i think i will just share some of the new sample pictures. i have recently discovered that using my friend tammy’s wonderful hand dyed fabric actually not only works – they look pretty fabulous!! i was so anxious to see that the first ones i did were fused – just couldn’t wait. i did 6 and gave them to tammy to do as she pleased. and here is what she created!! and it is now available as a kit – complete with fabrics to do all, even the binding AND includes all 6 patterns – for the (very) low price of just $54!! you can find them on my webpage, or in either of our booths at a show – the next being PIQF in Santa Clara, CA. 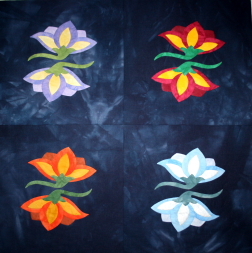 i also did a 4 season thing that is just one pattern done in 4 color ways to represent the seasons. i used one of my easiest designs. 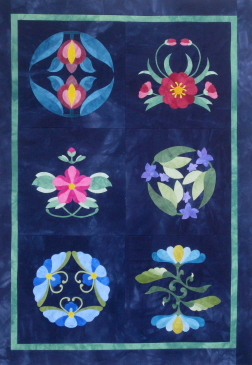 that one is hand appliqued. it also includes all fabrics and the pattern. the only fabric not included would be your choice for a narrow inner border. i figured you might want to choose which color to accent. the cost of that one is just $24.50!